Early in the morning on April 11, I awoke to shouting & noise from construction vehicles. Later, when leaving the area, I noticed that large transport containers were placed below my sleeping area, that is under a Route 93 off-ramp, near BHCC. I've been there for about a year & a half. Because this occurred early in the morning of the day after I was kicked out of Home Depot, it was probably no coincidence. I'm noting it because it might be an example of the strategic synchronization of attacks. The DOD might start a construction project, or some other area denial tactic, to extract me from the area. If so, it would be similar to what happened in Back Bay. When I attempted to post this message yesterday afternoon I was denied FTP access at a Starbucks on Montana Ave where FTP has worked multiple times. At the same place I was not able to tweet with my android. When I tried to post this update this morning at Starbucks on Wilshire BLVD I was blocked for nearly 1/2 hour. When attempting to establish a connection, an employee showed up next to me & started slamming cabinets. Now I am surrounded by citizen warfighters. On Thursday when I visited Santa Monica College I made sure the hot water was working in a specific bathroom. This is one place I have considered to make bowel movements that require a warm enema. When I visited on Friday to make a bowel movement there was no hot water. While in the stall my torso was attacked with directed-energy & there were many loud noises. Toilet seats & doors were slammed. Shutting off the hot water seems to be the DOD's attempt to prevent me from using this facility. The DOD is kicking me out of the area I've been staying along the Pacific Coast Highway. After they staged an accident yesterday, they took efforts to remove me from the somewhat secluded area along the PCH. I arrived in the evening after the "accident" to find my items thrown around & missing. Previously, they used audible noise & SOFO in their attempt to get me to leave. This has included: police, ambulance, & fire truck visitations & sirens; PsyOp products (litter) intended to cause negative emotions; city workers slamming barrels around; barking dogs running after me; people lingering in the area along the highway; frequent low-flying aircraft such as helicopters & propeller planes; etc. Today I'll be seeking another place in the area. The Department of Defense is currently attempting to kick me out of the Boston Public Library with its usual methods. Since 9AM they have used a rotation of citizens to approach the table & attempt to disrupt me with commotion & dialog. Just after one individual or group leaves, another arrives. The bags & books that they flash in front of me are PsyOp products with illustrations that convey threats. While traveling around I am blitzed by people jumping out from around corners. There are ongoing loud crashing sounds because of the construction project. Except for a period of about 20 minutes I have been denied wireless internet. In addition to interfering with the operating system, programs have malfunctioned. I was prevented from using the wireless internet at the Somerville Library yesterday. This morning at Starbucks on Newbury Street they temporarily blocked me from getting online. While that happened I was attacked with directed-energy & antagonized by citizens. The slow connection that I was able to establish was completely useless. I am now at the Boston Public Library where they previously blocked me for the entire day on May 28. 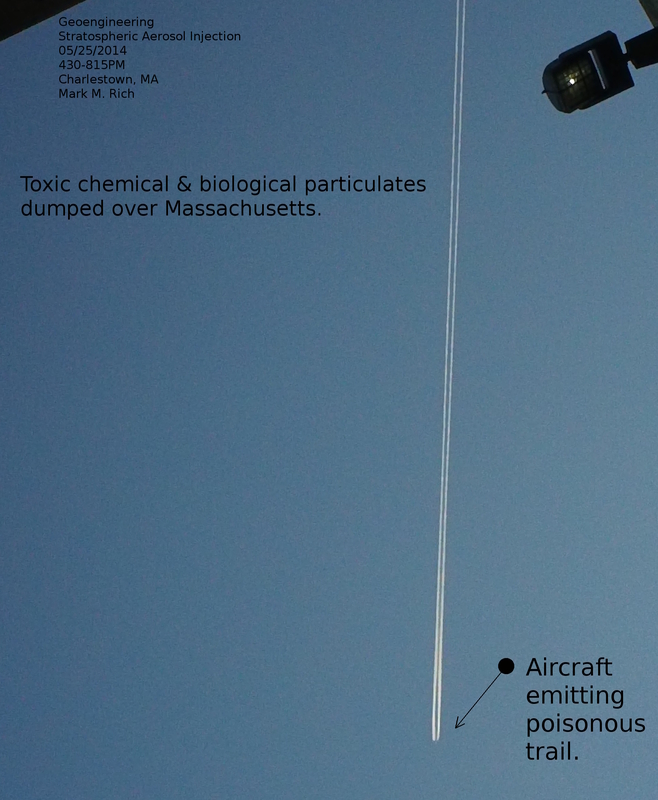 There was another severe chemical & biological fallout in Massachusetts yesterday. I witnessed the all-day event in Charlestown & Somerville. Although I observed it sporadically from 7AM to 815PM, it probably started earlier & lasted later. 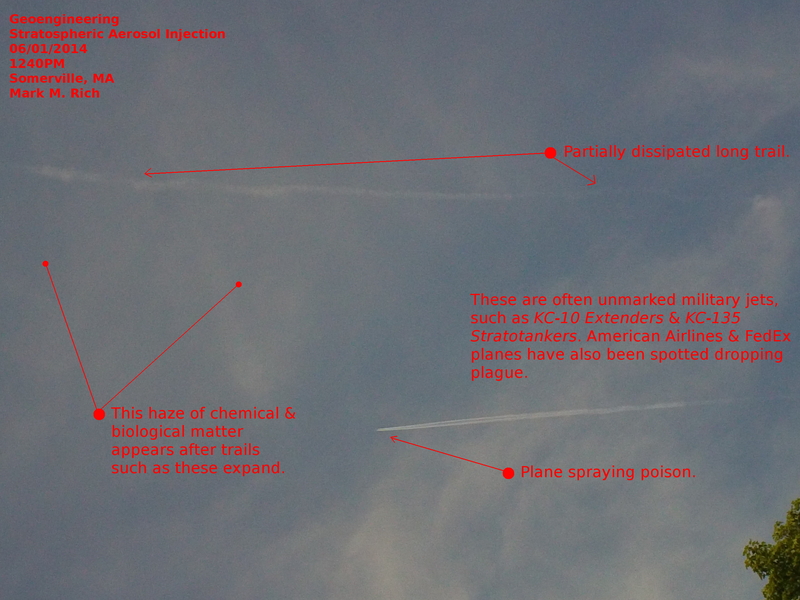 I took photographs of the spraying & resulting unnatural cloud formations that are shown below. There were short & long, persistent & nonpersistent trails. In early April I started to record these attacks at Paul Revere Park, often between 4-8PM. On May 26 I reported the worst attack to date. Yesterday there was another one that I observed at the park starting at about 5PM. 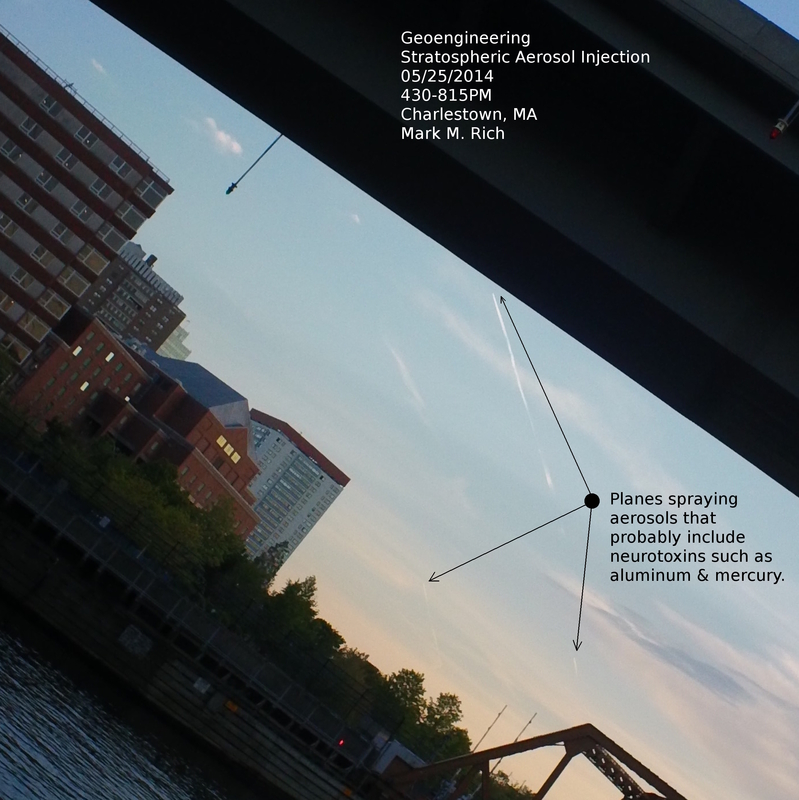 Planes from various directions, going back & forth in succession, unleashed an avalanche of toxins above this area of Massachusetts. I noticed again that my sinuses were irritated & there was a dry chemical smell/taste in the air. 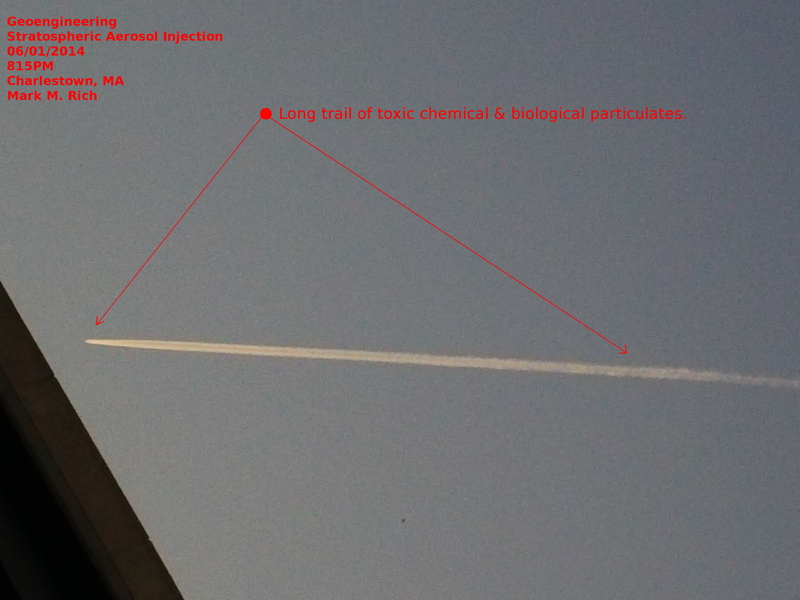 They seem to be increasing the quantity of toxins they are dumping on the public. This must be affecting people. I would not be surprised to learn of an increase in emergency room visits coincident with these particularly brutal fallouts. 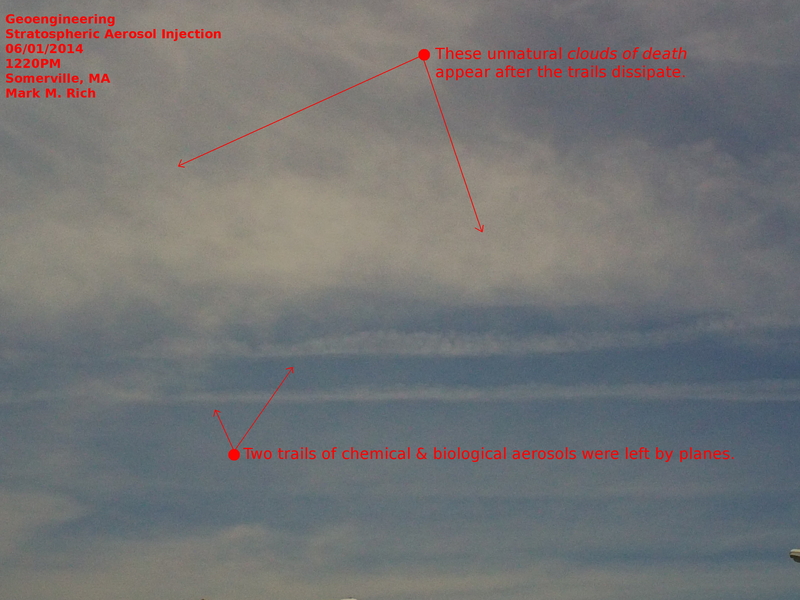 The most severe aerosol fallout that I've seen since I've been researching geoengineering occurred yesterday. I witnessed it at a park in Charlestown, starting at about 430PM. Below are some examples. 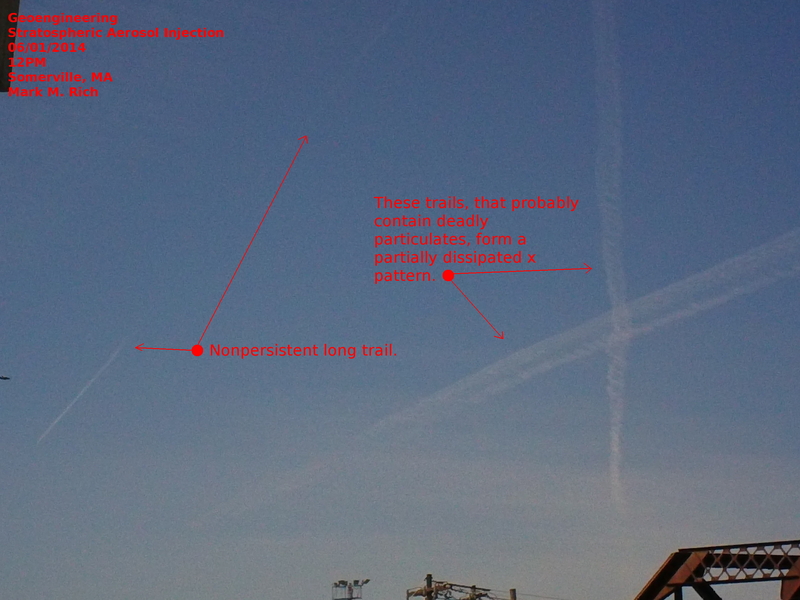 Over the span of 4 hours, I noticed many planes spraying a variety of trail types (persistent, nonpersistent, short, & long). I don't know how many there were in total. However, there were probably at least 10. I stopped counting at 60 passes. It may have been an hour or so into the spraying when my sinuses & throat became irritated. There may have even been a drop in temperature. I have also noticed that www.weather.com is not accurately presenting the weather in this area. On multiple occasions the agency has reported partially cloudy days, when the entire sky was covered with a silvery/grey mist. "Gardasil's long-term effects are still unknown and will remain so for decades. Reported short-term side effects include: infertility, seizures, strokes, autoimmune disorders, Guillain-Barre syndrome (GBS), chronic fatigue, hair loss, blood clots, headaches, vision and hearing loss, heart pain, weak muscles, disrupted menstrual cycles, paralysis, and death. Gardasil contains toxins such as sodium borate and aluminum adjuvants. Sodium borate is a poison used in roach killer products. Aluminum adjuvants, which are derived from aluminum, are supposedly used in vaccines to stimulate the immune system's response. Aluminum, however, is a known neurotoxin that causes bone marrow and brain degeneration. ... Gardasil also contains a surfactant named polysorbate-80 (tween 80), that is used by physicians to transfer chemicals through the bloodbrain barrier. Scientists have been aware for at least 2 decades that polysorbate-80 causes infertility in mammals." I am now surrounded by people at Bunker Hill Community College who are working on a rotation to aggravate me for any reason. A citizen approached me a moment ago & tried to get me to argue with her after placing her finger on my shoulder. She took the chair that was near me, along with the case for my laptop, after trying to instigate me into an argument. Minutes earlier another person did the same thing. It appears they are trying to provoke me into a violent confrontation to kick me out. While this is happening my intestines are being attacked with directed-energy. A true investigation of these mental hospitals would yield horrific results. In all likelihood these institutions are infested with degenerates who are given the authority to humiliate children for their sick amusement. They shut down the internet at Starbucks on Boylston Street this morning. I have not used this coffee shop in months & when I visited it today there was no wireless internet available. The clerk told me that the router was broken & she had no idea when it would be fixed. Normally on this day I'd use the Zumes coffe shop in Charleston, where they have also shut down my internet access. Later in the morning I went to the Boston Public Library to find that the 2nd floor where I previously studied is still under construction. When I asked a librarian at the information booth when the construction project would be completed, she became agitated. During this conversation, another librarian approached & stared at me, implying that I should not be asking those questions. On my way in & around the library, I was continually stocked by library workers & security guards who worked with citizens to crowd & block me. They just kicked me offline at the BPL. Rulers throughout history have feared intelligent individuals. Starting in the late 1880s a group of wealthy eugenicists decided to control public education in order to manufacture a society of obedient retards. Using an army of progressive educators, they gradually replaced the traditional material with animal training programs designed by behaviorists. They talked about using the schools to identify people to be targeted for negative eugenics. The public schools would be at the center of their eugenics endeavor. The identification & segregation or elimination of entire bloodlines was paramount. Although most people are unaware of it, a battle for the public schools in the US was fought over the course of 100 years. Many conscientious educators & politicians warned us of this. They have now completely seized the public schools. Their schools are conditioning factories where students are no longer educated, but trained to perform like animals. It is the role of educators to identify & change values. This is accomplished with a type of brainwashing known as values clarification. During group discussions, values are identified, crushed, & replaced with negative ones intended to prevent emotional/spiritual development. Those who resist the psychological poison are targeted for chemical attack. This is justified by "treating" seemingly legitimate medical conditions with psychostimulants & antidepressants. If you carefully research ADHD's history you will find that it is a complete medical fraud. It is now confirmed, the drugs used to treat ADHD produce brain atrophy, induce cancer, cause heart problems, & stunt physical growth. They also cause bipolar symptoms, afterwhich the victim is attacked with antidepressants. Drug company/eugenic fronts such as the American Academy of Pediatrics (AAP) & American Psychiatric Association (APA) are aware of this. These drugs are surely used as a softkill approach to negative eugenics. The sickened youths are effectively removed (chemically segregated) from the breeding pool & have a shortened lifespan. Trained by drug companies, the teachers & doctors are on the frontline identifying & medicating the resisters. Educators will continually badger parents until they comply & medicate (poison) their kids. They will also allow other children to gang-up & torment children who refuse the chemicals in order to pressure the parents. Disgusted? What else would you expect from a public school system run by eugenicist-psychopaths? It is no coincidence that ADHD symptoms considerably overlap the traits of giftedness. 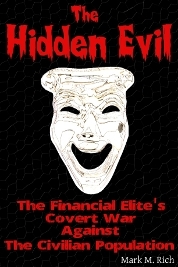 They are particularly interested in preventing the development of anyone who can make connections to expose them or lead a revolution. Therefore, if your child is an intelligent individual with leadership traits who resists the indoctrination, they may be targeted for chemical attack. 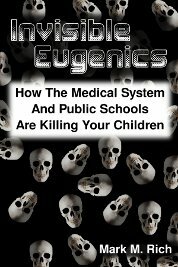 Note: For evidence which supports this twitter update please, see my book, Invisible Eugenics: How the Medical System & Public Schools Are Killing Your Children. 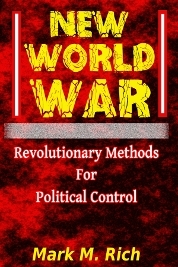 If you were @mentioned in this tweet & are interested in obtaining a free ePub or Kindle copy of my book, please email me, Mark@NewWorldWar.org. The aerial attacks with these neurotoxins are followed-up by a vigorous vaccination campaign done under the guise of preventing sickness & death. In reality, a critical examination of the evidence suggests that vaccines are SoftKill Chemical & Biological Weapons that inflict severe longterm medical conditions. Drug companies run the putrid medical system, which is designed to keep people sick for profit, social control, & eugenics. People near the city of Córdoba in Argentina are seeing an increase in cancer after glyphosate was sprayed on nearby GM soy fields. A variety of credible sources indicate that glyphosate & GM foods are being employed as chemical & biological weapons against an unsuspecting public, as part of a global eugenics agenda. In this case glyphosate was successfully used as a softkill chemical weapon which poisoned their soil & water supplies, causing an alarming increase in cancer & birth defects. Deutsche Welle: "Monsanto pesticides are causing birth defects and cancer in Argentina, according to a new report. In a farming community near Córdoba, residents say they have been poisoned by pesticides. 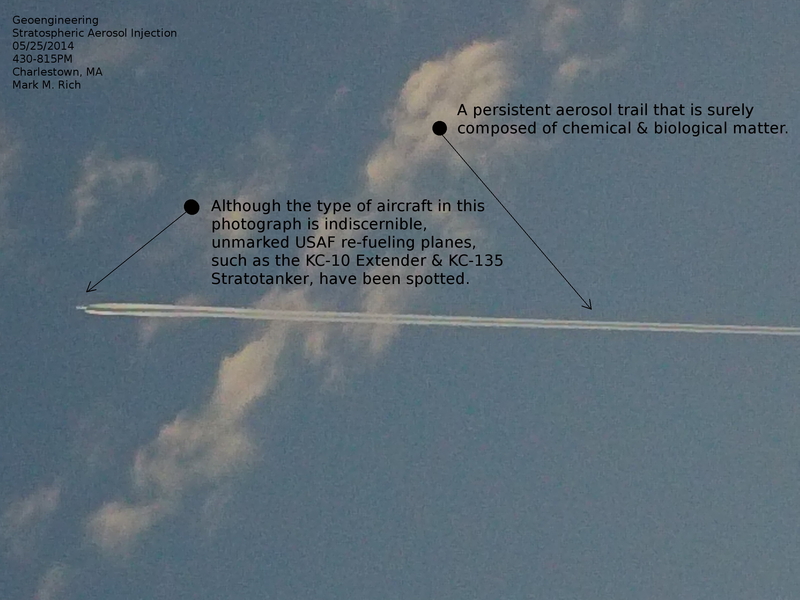 Planes regularly flew overhead, spraying the plants with the herbicide glyphosate. Slowly, the entire suburb started getting sick." Eugenicist-psychopaths run the medical system. The vaccines, which are Chemical & Biological Weapons (CBWeapons), are their softkill approach to negative eugenics. They blocked me from connecting at Zumes again this morning. The password I used did not work again. I made sure it was correct multiple times. Eventually they told me that the internet was down. I tried it again 1/2 hour later & was able to connect. Then when I selected the links to the stories in TweetDeck none of them worked. While all of this was happening I was shocked & stung. Now they are shutting down my internet at BHCC. While attempting to upload this I'm crowded by a student & attacked with directed-energy (nausea). They are now trying to kick me out of the Somerville Public Library. A library worker just told me to stop moving my legs because it is making too much noise. He said I'd have to leave if it continued. Allegedly the movement of my legs is causing a commotion downstairs. I am making little if any noise. When he approached me I was reading information on the GAVI website, & planned on tweeting more on how they are using SoftKill weapons (vaccines) to poison millions in developing countries. I was told: "I'm a library officer, you need to stop making noise." Earlier in the day I tweeted on the Psychiatric Chemical Weapons. 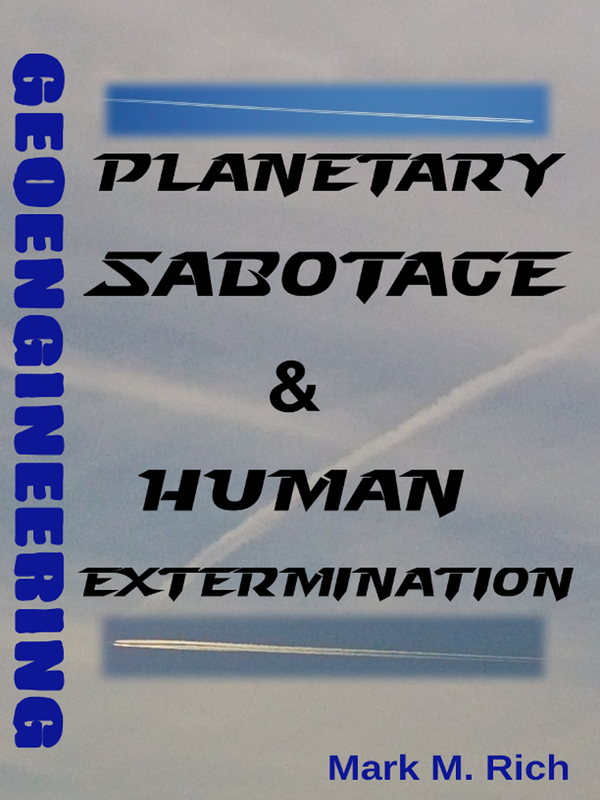 Typhoon Haiyan, #WeatherWarfare & #Eugenics? Typhoon Haiyan, about 2,500 injured, 1800 confirmed dead, an estimated 10,000 total deaths according to some. Delays in aid, scarce food & medical supplies will ensure the deaths of thousands more. See: CNN & SkyNews. 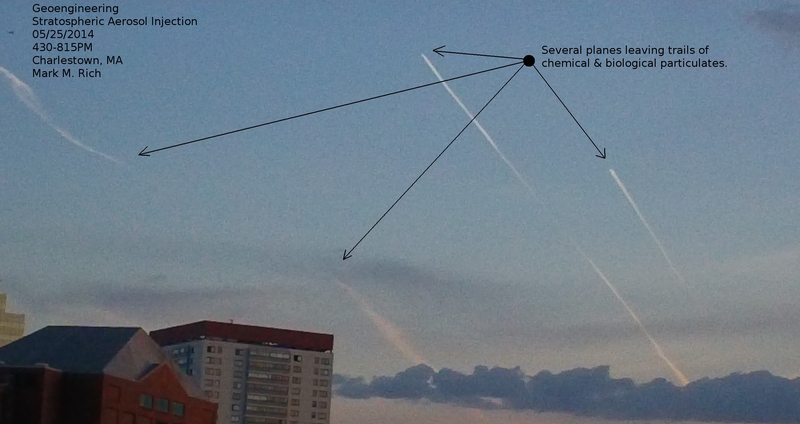 According to 21st Century Wire & Geoengineering Watch this disaster was geoengineered. See Weather Warfare. #CNO #Swarming #SOFO #Blocking. It took 5 minutes this morning to login to my email at the BPL. Internet Explorer generated an error when printing a map of Charlestown. Then the printer did not print the map when I was finally able to get the computer to print. A security guard blocked me while I was walking away from the printer. I was surrounded by people who behaved like animals in the BPL computer room. I left the library for less than an hour during which time I was swarmed by vehicles & people. Walking back into the library on my way to the courtyard, I was crowded by a security guard who made an abrupt movement holding up his walkie talkie, as if to imply I was the object of interest. Then walking from the courtyard, a police officer walking toward me stopped on the same path I was on, basically blocking me. Minutes later, walking down to the 1st floor, a group of police officers crossed my path. Basically, each time I got up to move around during my second visitation at the library, there was a police officer or security guard. Now they are kicking me offline. While I was uploading this update a library worker walked over & told me to move because they are rearranging the area.